Wine Duty Frozen – A Cold Move? This Wednesday 18th March, the UK waited in anticipation as chancellor George Osborne delivered his 2015 Budget to Parliament. The political event was typically drawn out and as the general public lost all interest by Wednesday evening (and the Lib Dems lost all sense by Thursday morning…a ‘Yellow Budget’?! ), the inevitable budget-day-question creeping its way into everyone’s mind was: “Am I a winner or a loser?” Well, if you’re as obsessed with wine as we are, then you’re a winner…sort of. The news that the chancellor had announced a freeze on wine duty in 2015 was met with first with joy and then later with begrudging disappointment by the wine world. With The Wine and Spirit Trade Association (WSTA) launching their official ‘Drop The Duty!’ campaign back in mid-December 2014, a lot of hard work was expended in attempting to persuade Mr Osborne to cut the duty on wine and spirits. The campaign was greeted with zealous support by the drinks trade and it’s not difficult to see why. 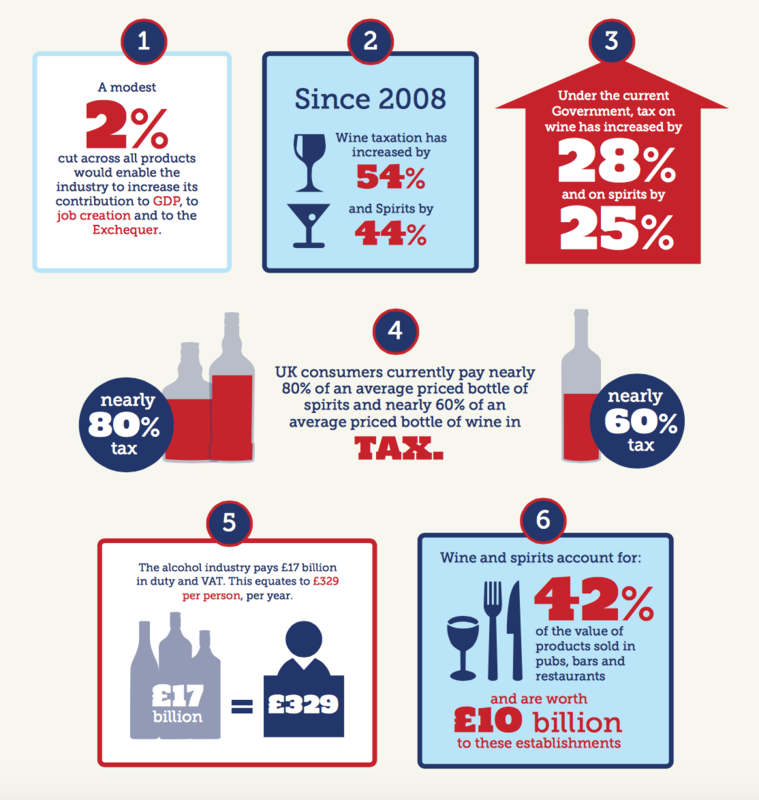 Exposing facts such as UK consumers currently paying almost 60% tax on an average priced bottle of wine, when the wine and spirit industry directly supports around 518,000 jobs in the UK and is worth £22 billion annually to its economy, the campaign highlighted the inequality UK businesses and consumers face. In a likely pre-election charm offensive, the chancellor half-heeded the campaigns calls, but wine still fared worse than other drinks. 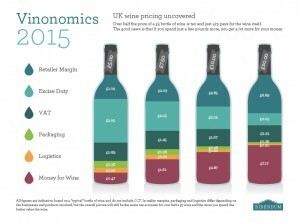 Duty on spirits and cider was cut by 2%, and beer by 1p per pint, whilst wine was left to make do with a freeze on duty, leaving the UK with still the second highest rate of wine duty in the UK (after Ireland). 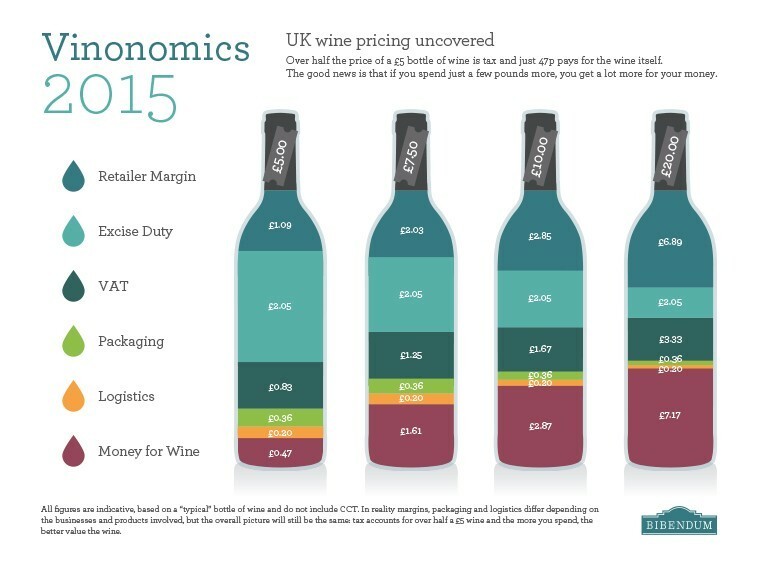 Although an improvement on last year, when wine duty still rose with inflation whilst the ‘escalator’ of annual increases for alcoholic drinks was scrapped, Bibendum’s chart below shows that half the cost of a cheap bottle of wine still goes to the government.